Prior to living on this farm, this paper wasp best would have been toast in our world. One or more of the spray bottles would have been utilized to poison every last creature that moved in or around this every growing nest. A funny thing has happened. Each and every time we look into the life of an insect we find on the farm we are surprised. 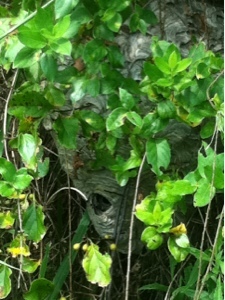 In the case of this nest it houses the bald faced hornet, a hornet with a black body and white face and tail. Almost an inch long when flying around, one flying past will stop you and get your heart racing. And it turns out they pollinate a little, but mostly eat other insects: yellow jackets, filth flies and blow flies. I can't identify flies. But we have plenty and actually prefer the bald faced hornet to the flies...as livestock farmers, the fewer the flies the better! So the nest will stay here. And we will keep a respectful distance. This photo was taken from inside the truck, windows up, air conditioning on, heart pounding.